Students from Argentina, India, Vietnam, Canada, Brazil, England, Ireland, United States and the Phillipines were among the more than 3,000 learners from nine countries who connected to The Canadian Canoe Museum via Skype as part of its virtual field trip program in 2018. 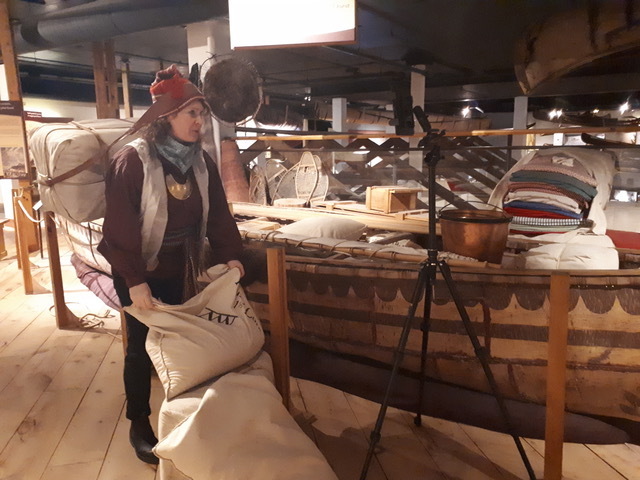 The virtual field trip program, Fur Trade Travels and Tales, explores the role of the canoe in the development of the trading networks, routes and relationships of the 18th century. Artifacts from the museum’s collection—the largest of its kind in the world—inspire discussion, drama and a visit to the Voyageur Encampment. On an almost daily basis, museum educators are in the galleries, equipped with an iPad and extra lighting, interacting with classrooms of students from Grade 2 to Grade 12. Programs Coordinator Kelly Pineault, in character as a Voyageur, encourages classrooms of students to take up their imaginary paddles and keep a pace of 50 to 60 strokes a minute. In Fur Trade Travels and Tales, students learn about the key relationships between First Nations and newcomers during the era. Meanwhile, Canada By Canoe offers a whirlwind tour to diverse geographic regions of Canada to explore the traditional Indigenous watercraft and the diverse peoples who build them. For classes within a two-hour bus ride, the museum also offers more than 20 hands-on, experiential education programs for students and youth groups from kindergarten through to university and college by day and overnight. In 2018, close to 5,250 students visited the museum in person. Field trips are guided by educators offering curriculum-connected programming in both French and English. 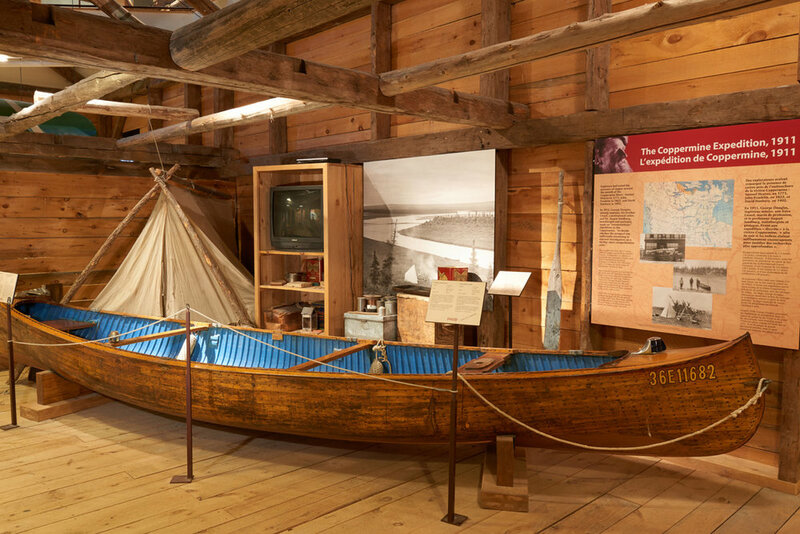 Learn more about the Canoe Museum and its local and global programs here. An anonymous out-of-province donor who believes in the power of the canoe to connect Canadians has invested $1.25 million to support the Canadian Canoe Museum’s move to the water’s edge as part of its $65 million capital fundraising campaign. This generous gift is the first of its magnitude to be received from a donor outside of Ontario, demonstrating the national scope and scale of the new museum project. The Canadian Canoe Museum is moving from its 1960s-era former factory building to an 85,000 square-foot-facility to be built alongside the Peterborough Lift Lock on the Trent-Severn Waterway—both National Historic Sites—in Peterborough. “The new museum will not only allow us to attract more visitors from across the country, it will allow us to reach out from coast to coast to coast in new and different ways—it will be our new high-profile headquarters,” adds Morris. The new museum, which will make accessible all 600 watercraft, thousands of small artifacts and an archive, is designed by an award-winning team of heneghan peng architects (Dublin, Ireland) with Kearns Mancini Architects (Toronto, Canada). The museum has partnered with world-class exhibition design firm GSM Project to create one-of-a-kind visitor experiences. Peterborough’s Rachel Quilty was born with a partial left arm and has lived with a prosthetic for most of her life. The 19-year-old, who is affiliated with War Amps, had always wanted to become a camp counsellor at Camp Oconto—an all-girls camp where she had spent many years as a camper. With her prosthetic, she wasn’t able to complete level D instruction with a traditional paddle which she’d need to teach canoeing as a counsellor. 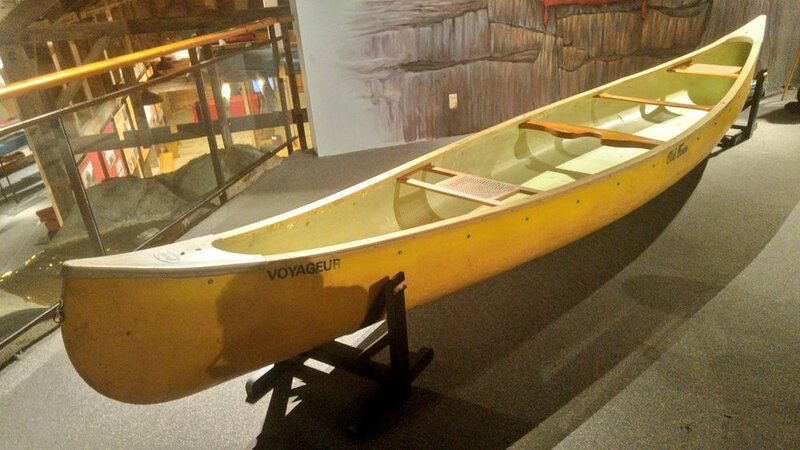 After seeking advice from fellow camp counsellors and getting the word out, The Canoe Museum writes in a blog post how volunteers, retail business and organizations came together to make a paddle that worked for her. 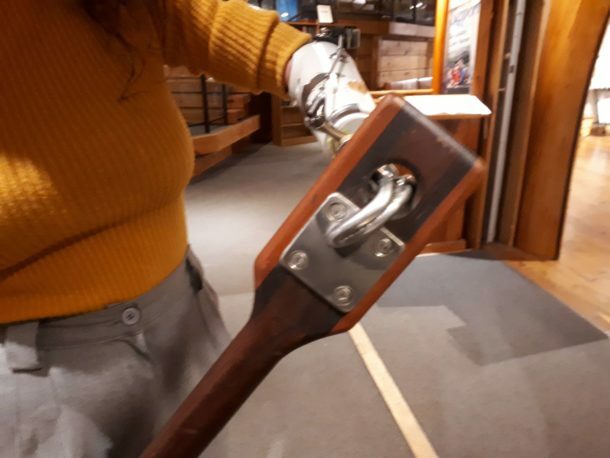 “Wild Rock Outfitters donated a used paddle for the first prototype, in which a hole was added to accommodate the hook at the end of her prosthetic arm,” the Canoe Museum writes. More than 10 design prototypes were made over the next year to fit with Rachel’s prosthetic. When Five Counties Children’s Centre asked Wild Rock if there was anyone they could recommend as this project evolved to find her the perfect fitting paddle, they suggested the Canadian Canoe Museum and that’s where volunteer Rick Schuett became involved. Rick, who has been creating custom canoe paddles for three decades, carves paddles on the second floor in the artisan exhibit area on Fridays. Rick’s first paddle for Rachel worked well, with its middle connector on the shaft for movement, but over time the constant pressure eventually broke it apart and the metal hook from her prosthetic wore down the wood on the paddle’s grip. -> Rachel puts the hook from her prosthetic arm through the hole in the grip and uses her right arm to move the bottom of the paddle. -> The notch in the middle acts as the wrist she doesn’t have on her left hand and then she’s able to maneuver the paddle to perform various strokes. With Rick’s expertise and dedication, he has given Rachel the means to accomplish her goals. The Canoe Museum says that in addition to becoming a camp counsellor, Rachel is working as a certified lifeguard and swim instructor at the Peterborough Sport and Wellness Centre where she also uses the specialized paddle to teach swimming. A Canadian icon was in Peterborough on Thursday (December 7th). 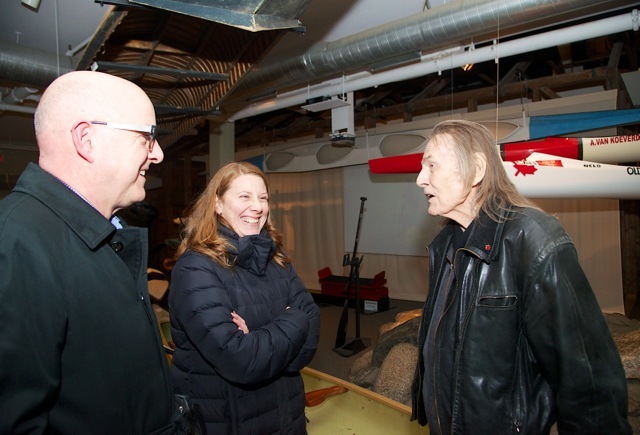 Singer-songwriter Gordon Lightfoot dropped by the Canadian Canoe Museum to donate canoes that will become part of the museum’s storied collection. “Needless to say, it’s been an incredible day," says Jeremy Ward, Curator for the museum. "We are honoured to be adding to our collection three of Gordon’s canoes and one from his good friend and paddling companion, Fred Gaskin." 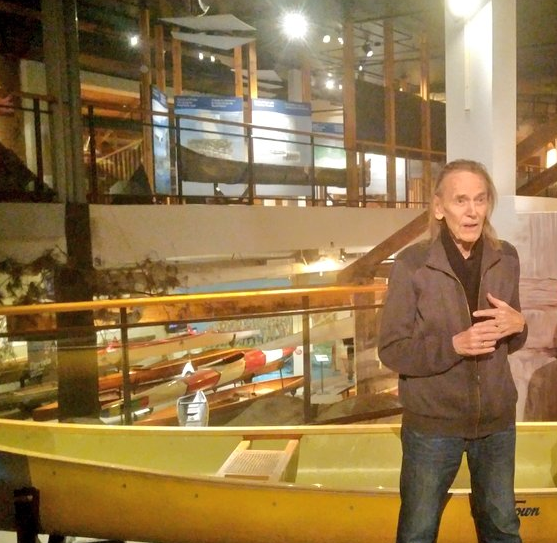 Gordon Lightfoot at Canoe Museum in Peterborough, Canada. Gordon, an avid paddler, has donated the yellow canoe featured in the song "Canary Yellow Canoe". This canoe showcases the scars of an infamous mishap when Gordon and his friend Fred paddled the Nahanni River in the 1970s. The yellow canoe that inspired Lightfoot's song "Canary Yellow Canoe"
"We know that for Gordon, canoeing was a critical diversion from a very demanding career," adds Ward. Over the past week, the Canadian Canoe Museum welcomed an incredible 18 international visitors from 11 countries, reflecting a trend of increasing international interest in its world-class collection. Between October 17th and 25th, these individual international visitors from countries including Australia, Germany, Mexico, Russia and India signed the guest book and longtime museum volunteer Bernice Standen took note. “We are fortunate to have the preeminent collection of paddled craft in the world,” says Mrs. Standen, a museum volunteer who, since 2004, has been working with visitor statistics. In 2016, 25 percent of those who signed the museum’s guest book were international visitors—up from 14 percent in 2015. Visitors to the museum come from all over the world, and last year the guest book documented those from more than 30 countries. Many international visitors explore the museum more than once. In 2016, the museum welcomed 27,267 visitors overall—an increase of close to 2.5 percent over the previous year. That increase built upon the attendance figures of 2015, which were 11 percent higher than in 2014. Early projections indicate that the new museum, to be built beside the Peterborough Lift Lock on the Trent-Severn Waterway, will welcome more than twice the number of visitors in its opening year alone. “Our collection, and the museum as a whole, continues to attract national and international attention,” says General Manager Carolyn Hyslop. “This, paired with the local excitement related to the new museum project and some of our newest programs, contributes to the incredible momentum we are experiencing right now." The Honourable Maryam Monsef, Minister of Status of Women and Member of Parliament (Peterborough–Kawartha), on behalf of the Honourable Mélanie Joly, Minister of Canadian Heritage, announced on Friday (February 24th) that the Canadian Canoe Museum is receiving $1,410,672 to fund architectural and engineering plans required for the construction of a new museum facility in Peterborough. The funding announced will support the preparation of pre-construction documents, including architectural and engineering plans. The new museum facility will be built on a Parks Canada site adjacent to the Peterborough Lift Lock National Historic Site on the Trent-Severn Waterway. Via our friends at Trail Swag comes this video shot at the 6th Annual Beaver Club Gala, which gave people the opportunity to dress in clothes from the fur trading days and help support the museum through donations and auction items. This year's host was Les Stroud from Survivorman.